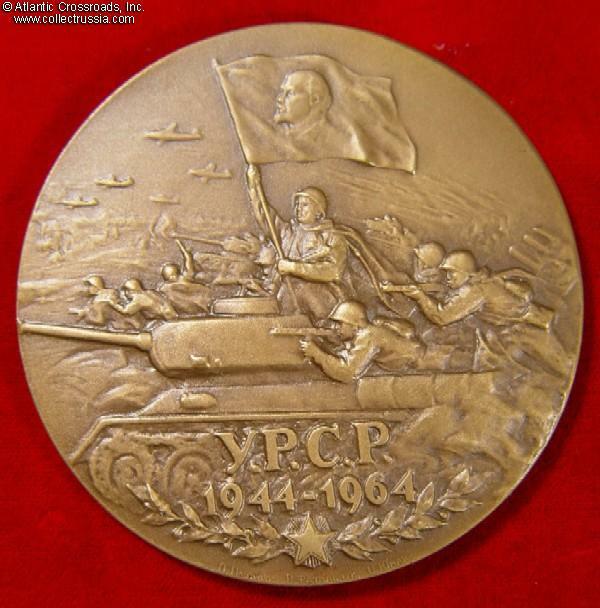 $490.00 300th Anniversary of the Reunification of Russia and Ukraine, 1954 limited edition bronze gilt table medal issued to Communist Party VIPs. Comes with original case of issue in Karelian birch with hallmarked silver presentation plaque. A scarce, beautiful and impressive set. $35.00 "Electrification of the Country", bronze table medal by M. Manizer, 1962. $30.00 Table medal in bronze commemorating Yuriy Gagarin, the fist man in Space. Struck by the Moscow Mint in 1990. $130.00 Table Medal in Bronze in Commemoration of World's First Manned Space Flight. A very attractive 65 mm medal struck in 1962 at the Leningrad Mint to celebrate the Gagarin's space flight during the previous year. In excellent condition. $110.00 Bronze Table Medal in Commemoration of Soviet Long Duration Space Flights, 65 mm, 1981 issue. The medal celebrated recent Soviet achievements in space, in particular the record-setting flights of Cosmonauts Lyakhov, Popov and Ryumin aboard the Salyut-6 Space Station. A total of 1500 of these medals were struck at the Leningrad Mint. In excellent, near mint condition. $95.00 40th Anniversary of the Creation of the Azerbaijani SSR, table medal in bronze, 1960. A very attractive 65 mm medal in excellent condition. Shows the name of the medalist who created the original artwork. $140.00 40th Anniversary of the Creation of the Moldavian SSR and the Communist Party of Moldavia, table medal in bronze, with original issue pouch and named award certificate, 1964 issue. In very fine to excellent condition. Relatively uncommon medal to find in a complete documented set. $70.00 100th Anniversary of the Morozovskaya Strike in 1885, table medal in bronze, 1989 issue. One of only 800 pieces in circulation. $75.00 Fifty Year Anniversary of the Stakhanovite Movement in 1985, Table Medal in Bronze, struck in 1989 with an unknown mintage. $20.00 250th Anniversary of the Verkh-Isetskiy Metallurgical Plant, 1976, table medal in bronze. $50.00 Table Medal in bronze Commemorating Pavel Anosov, the Inventor of Russian Bulat Steel	(Russian equivalent of Damascus or carbon steel), 1982. One of only 850 pieces in circulation. $120.00 VII International Congress for Protection of Plants, Table Medal in bronze, 1975. One of only 150 medals minted for the participants of the scientific conference in Moscow. In excellent condition. $12.00 Contest in Military and Technical Sports, DOSAAF table medal, 1970. $15.00 Moscow Tourist Club 40th Anniversary, commemorative neck medal. $25.00 Cased Bronze Hungarian Lenin Propaganda Table Medal. $20.00 Unusual 60mm Lenin Table Medal, probably struck in one of the Warsaw Pact nations.